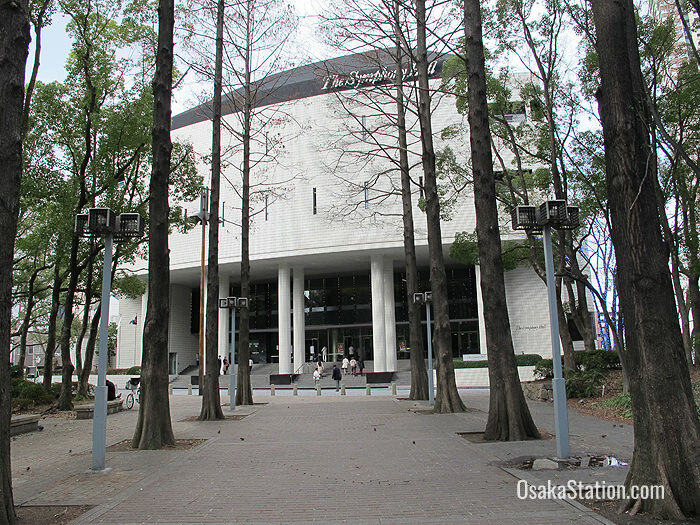 The Symphony Hall in Osaka was built in 1982 as the first Japanese concert hall that was specifically designed for Western style classical music. Over the years the Symphony Hall has gained a reputation for its excellent acoustics and the great Austrian conductor Herbert von Karajan declared it to be “one of the best halls in the world”. He was apparently so happy with his own performance here in 1984 that he got down on his knees to kiss the stage! 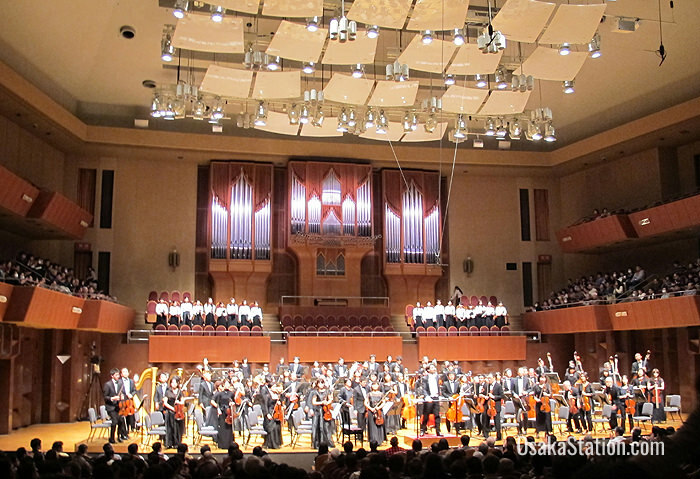 It was the Japanese conductor, Takashi Asahina, who called for the building of a music hall devoted to classical concert performances. He requested a simple design focused purely on the music and without an orchestra pit, or a moveable stage like those in multipurpose venues. As a result the Symphony Hall has an extremely sophisticated acoustic system. Every aspect of the interior, from the walls, to the cork floor, to the sound reflecting boards on the ceiling, is designed to perfect the listening experience for the audience. In fact the hall boasts a two second reverberation time which is apparently for classical music quite close to perfection. 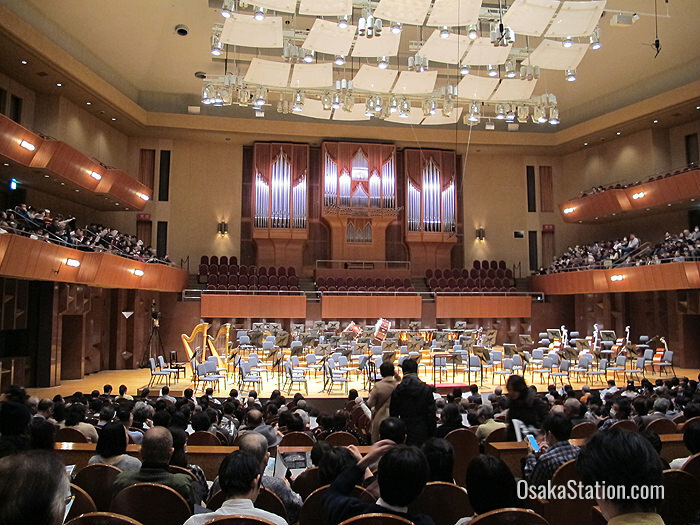 The hall is an arena with enough plush seating for 1704 people and it is designed in such a way that every seat has the best possible view of the stage. In this way both visually and aurally you can fully enjoy the passion and energy of the conductor and musicians. At the rear of the stage is a large and very beautiful pipe organ built by the Kuhn Organ Builders of Switzerland. 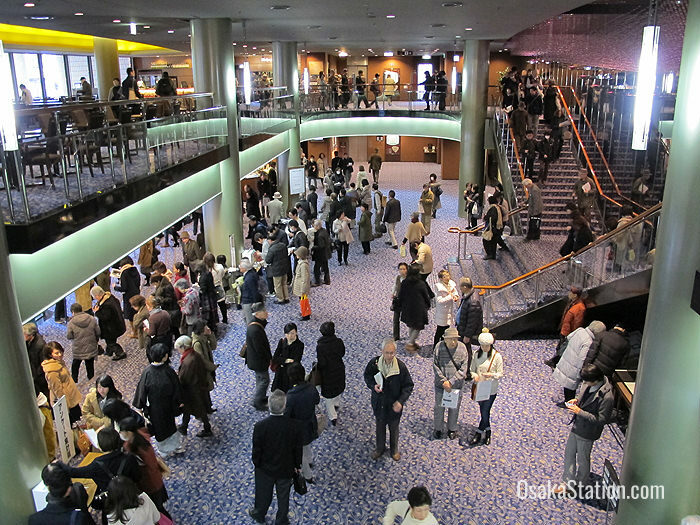 Outside the performance hall there is a spacious lounge and cafe area serving tea, coffee, wine, juice and champagne. It is a good space to relax, enthuse, or share your thoughts in the intermission between performances. There is also a shop where you can buy original stationary and pens as a souvenir of your visit. The closest station to the Symphony Hall is Fukushima Station on the JR Osaka Loop Line. Walk north from the station and you will be there in 7 minutes. 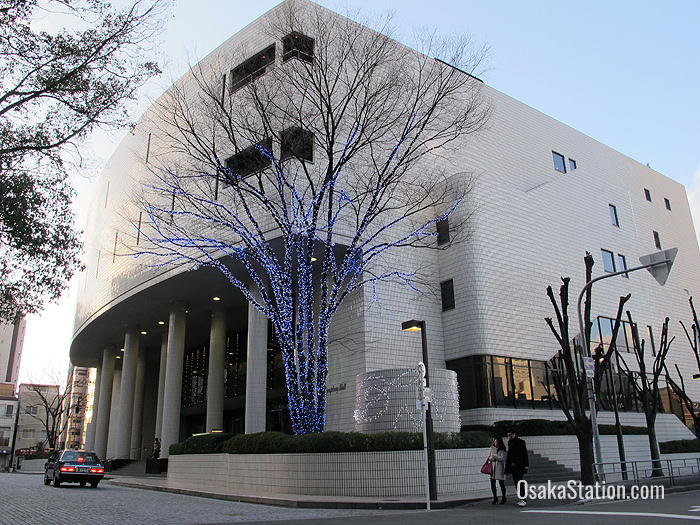 It is also possible to walk west from Osaka Station and be there in 15 minutes. For the schedule and ticket information please check the official website.Telephone enquiries can be made in Japanese at 06-6453-6000.